To say craft breweries are bubbling up all over the United States no longer does the fact justice. The number of craft breweries nationwide has nearly tripled over the past decade, totaling 4,225 in 2015, according to the Brewers Association. Besides offering countless varieties, craft breweries like to promote themselves as a better-tasting, better-quality beer than the alternative macrobrews. 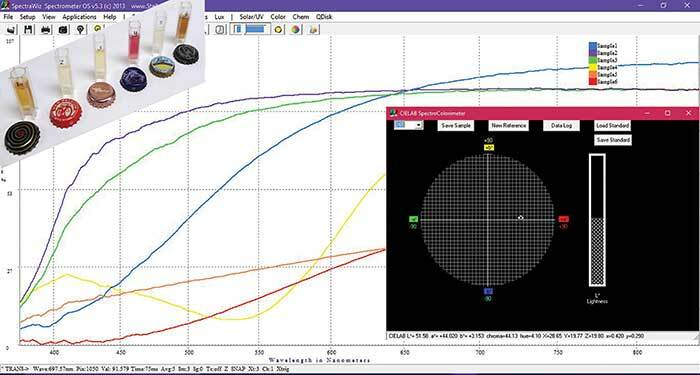 While taste is a subjective and hotly debated topic, beer quality is something that can easily be measured with spectrometers. An explosion in American craft breweries has created the need for spectroscopy-based quality control systems. Courtesy of Kelly Krauser. Between 2006 and 2015, U.S. regional craft breweries, which have an annual beer production between 15,000 and 6 million barrels, have seen their output nearly triple to 17.6 million barrels per year, according to the Brewers Association. Such rapid production growth means more of them are crossing the point where it is more feasible to use spectrometers in-house rather than outsource quality control to laboratories. The quality control of a beer means ensuring it meets the specifications set in place for the style of beer, and keeping future batches consistent. This can include using specific combinations of barley and hops, fermentation temperature, and finishings to produce the desired beer. Being able to track and objectively record values pertaining to every step of production ensures specifications are met and consistency is achieved. Between 2006 and 2015, the number of craft breweries nationwide nearly tripled to 4,225. 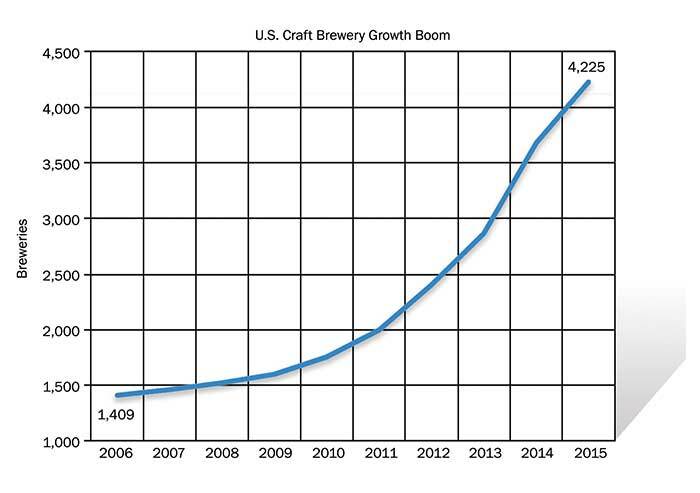 Chart prepared by Photonics Media Inc., based on data from the Brewers Association. Spectroscopy works on the principle that light interacts with all forms of matter in several different ways. Light can either be absorbed, reflected or transmitted. Being able to measure light’s interaction with certain matter can provide valuable insight about a material’s composition and properties. Spectroscopic quality control testing provides a straightforward, low-cost method capable of rapid sample analysis. Incorporating a spectrometer in a brewery’s quality control process can save time and money in a variety of ways. Spectroscopy is considered a nondestructive analysis method and allows data to be gathered without the need to sacrifice raw materials or products for one test. Multiple tests can be performed on one cuvette with little to no sample preparation. The ability to perform most measurements with minimal sample preparation aids in the ease of use and provides the ability to acquire results quickly. If a brewery can use an affordable instrument like a spectrometer, which provides data in real time, the benefits multiply. The color of beer can be recorded and compared to standards to observe the consistency of each batch. Courtesy of StellerNet Inc. When it comes to craft beer quality control, spectrometers show their value in the variety of their testing capabilities (Table 1). Spectroscopic measurements can be implemented in every stage of brewing, from analyzing raw materials to measuring the color of a finished beer in the bottle. Near-infrared (NIR) absorbance measurement is one technique that can be utilized throughout the entire brewing process. NIR spectroscopy can measure percent of moisture, starch and protein in grains and other raw materials before brewing starts. Before fermentation can begin, the mixture of grains and water — called the wort — must be tested for the amount of amino acids present. The free amino nitrogen (FAN) levels in the wort are crucial to the propagation and growth of yeast there. If these protein levels are too low, fermentation may occur slower than expected. If levels are too high, fusel alcohols can develop, leading to off-flavors or infection from other organisms. Tracking values with a spectrometer and a specially designed assay can help determine the levels of amino acids in the wort. The hop plants produce a variety of oils that are useful in brewing. These flowering vines are used to impart bitterness in beer, measured in international bittering units (or IBUs). The bitterness helps to offset the sweetness from the sugar in the grains, and can add a citrusy-like flavor and aroma to certain beer styles. Some styles, like India pale ales, require a large amount of hops to get the correct flavor profile. Hop oils will absorb light in the UV region, and there is a linear relationship to the light absorbed and the concentration in the sample. Using this knowledge, a UV-VIS spectrometer can provide accurate hop oil concentrations. Pre- or post-fermentation measuring and recording the beers’ IBUs allows brewers to set a standard and reliably check the potency of hops as well as the bitterness of the beer. UV-VIS spectroscopy can provide carbohydrate content, and analyze bitterness in the wort (also referred to as pre-fermented beer) or in finished beer. Courtesy of StellerNet Inc.
After the yeast has done its job and created the finished beer, there are still several other tests that must take place. Before a batch can be bottled and put in front of a customer, there is typically a testing and sensory panel that the beer must pass through. In these tests, specially trained personnel will taste and observe the beer for several qualities. These testers will check for off flavors, mouth feel, carbonation, clarity and color. A trained palate will never be replaced by an instrument for mouth feel and off flavors. However, more subjective measurements, like color and clarity, can be made measurable using a miniature spectrometer. 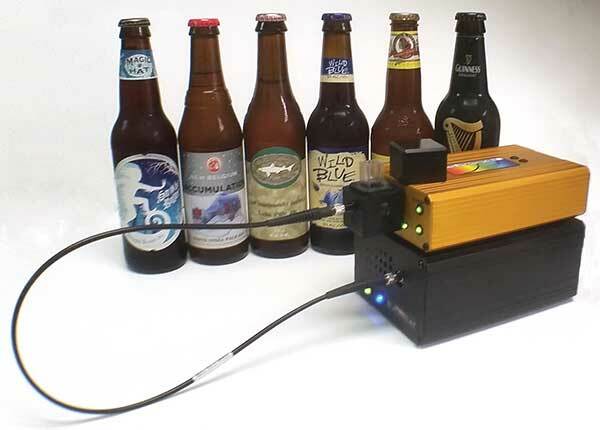 A probe and light source can be used with a UV-VIS spectrometer to take color measurements of finished beer and allow for quantifiable color matching, providing reliable data. Using an instrument that requires a technician with a doctorate to operate it is illogical. While a spectrometer itself is uncomplicated, the instrument proves its worth if a user understands the information it is providing. Any brewer or lab manager should have no problem picking it up, performing simple tests and getting results. The real utility of these instruments shines when users understand the basic principles of light. If brewers can familiarize themselves with how light interacts with matter, the instrument can become more than just a means to test beer. With understanding, these instruments can become tools to help study it. Certain principles, like the Beer-Lambert Law, sometimes more aptly called Beer’s Law, relates the amount of light attenuated in a sample with the properties of the sample. 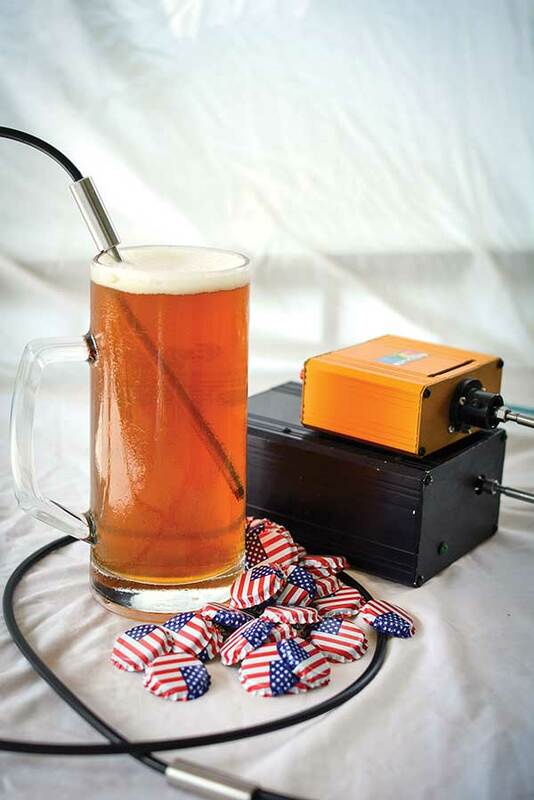 Understanding how Beer’s Law works, and how it applies mainly to UV-VIS absorbance spectroscopy, can be applied to multiple applications and provide actual insight, and not just values on a screen. Brewers can better understand their product by knowing the components of the beer in its different phases, and understanding how each interacts with light. Maintaining accurate records and repeatable measurements is key to building a solid quality control program. The burden to make sure the consistent measurements are taken and recorded properly often falls on the shoulders of the quality control technician. Having a well-trained employee capable of using, understanding and accurately recording data is a solid foundation for excellent quality in a product. This basic knowledge and data management allow for the instrument to play a larger part in the overall quality control process. With this framework in place, trends can be identified and tracked throughout the brewing process. Noticing these trends can help prevent potentially disastrous problems from arising. Brewing is not like most manufacturing operations when it comes to dealing with defects. With most manufacturers, a single defective product in a batch can be fixed or eliminated and the cost is minimal. In brewing it takes roughly the same amount of time to brew five gallons of beer as it does to brew 500 gallons. The only difference is the size of the tanks and the quantity of ingredients. Because of this, breweries favor producing in large quantities, such as several hundred gallons per batch. One small setback will affect the entire batch. If uncorrected, this issue can cost a brewery several thousand dollars. In smaller breweries it is cost-effective to send samples out to labs for analysis. However, this takes time, and if a problem is detected too late, it could mean a loss of beer and profits for the brewery. Mitigating product loss is an important job of any quality control department. Allowing a product that doesn’t meet specifications to be released can have worse results down the line. In an industry that prides itself on consistently delivering a quality product, lacking in either consistency or quality can literally and figuratively leave a bad taste in customers’ mouths. Unfortunately for breweries, an unhappy customer is far more likely to tell a friend about a bad experience than a good one. Like beer, once a brand’s reputation is tainted, it can prove difficult to fix. With continued advancement of this type of technology, the future promises vast amount of improvements for these types of instruments. As people continue to experiment with designing and modifying this technology, the cost associated tends to decrease. Less robust versions of spectrometers are currently finding their way into consumers’ hands in the form of smartphone attachments. Newer technology is allowing instruments to become very small. 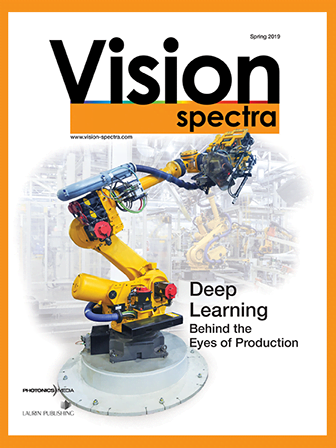 Microelectromechanical systems can replace traditional optics inside spectrometers. Typical spectrometers use a grating and mirrors to properly diffract light and image it on a detector. A MEMS spectrometer uses a single miniature mirrored grating that moves quickly to project wavelengths on a detector. New products can be born when technology becomes more affordable and smaller. In the near future, brewers may see a company developing an all-in-one brewery quality control laboratory that fits in a suitcase. Such a system would likely be “open and measure,” potentially taking any sample preparations out of the equation. Placing a sample in a cuvette might allow multiple tests to be run autonomously. Maintaining quality and consistency is essential for any business, but it becomes even more important when it is a beverage. These types of low-cost spectrometers provide valuable information to the brewers, and show lab and production managers where improvements can be made in the process. The reliability and the affordability of the instruments make them a cost-effective addition to any lab interested in improving quality. Continual improvements to performance and usability will allow for more automation and will enable these instruments to be easily integrated into facilities and operations. Ryan Bean is an applications scientist with StellarNet Inc. in Tampa, Fla; email: rbean@stellarnet.us. Also known as UV-VIS spectrometer, a device that measures the absorbance, reflectance or transmittance of light in the ultraviolet or visible wavelengths absorbed, reflected or transmitted. Commonly used for the detection of impurities in organic molecules or for characterizing compounds.